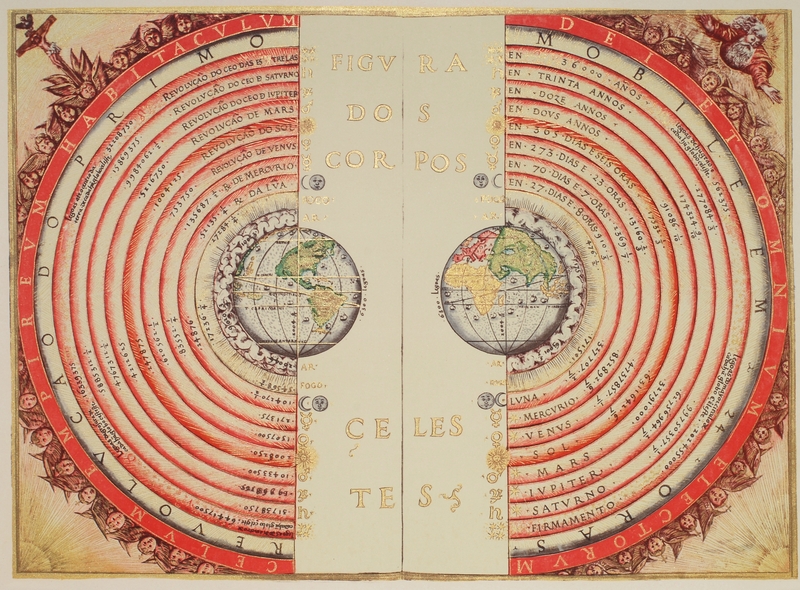 Figure of the heavenly bodies — An illustration of the Ptolemaic geocentric system by Portuguese cosmographer and cartographer Bartolomeu Velho, 1568 (Bibliothèque Nationale, Paris). The Catalan Atlas is the most important Catalan map of the medieval period (drawn and written in 1375). It was produced by the Majorcan cartographic school and is attributed to Cresques Abraham (also known as “Abraham Cresques”), a Jewish book illuminator who was self-described as being a master of the maps of the world as well as compasses. 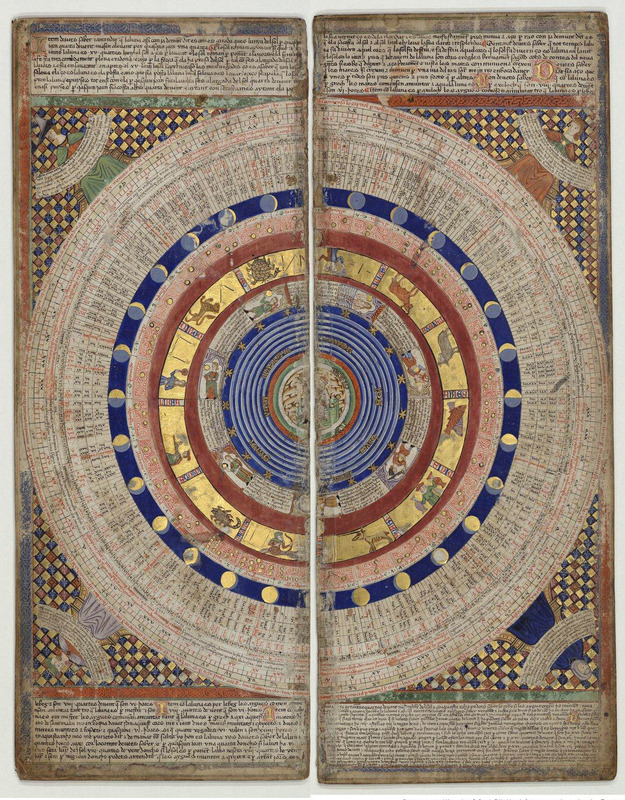 It has been in the royal library of France (now the Bibliothèque nationale de France) since the time of King Charles V. The Catalan Atlas originally consisted of six vellum leaves folded down the middle, painted in various colors including gold and silver. The leaves are now cut in half. Each half-leaf is mounted on one side of five wooden panels. The first half of the first leaf and the second half of the last leaf are mounted on the inner boards of a brown leather binding. Each measures approximately 65 × 50 cm. The overall size is therefore 65 × 300 cm. The first two leaves contain texts in Catalan language covering cosmography, astronomy, and astrology. These texts are accompanied by illustrations. The texts and illustration emphasize the Earth’s spherical shape and the state of the known world. They also provide information to sailors on tides and how to tell time at night. The first two leaves, forming the oriental portion of the Catalan Atlas, illustrate numerous religious references as well as a synthesis of medieval mappae mundi (Jerusalem located close to the centre) and the travel literature of the time, notably Marco Polo’s Book of Marvels and Mandeville’s Travels and Voyage of Sir John Mandeville. Many Indian and Chinese cities can be identified. The explanatory texts report customs described by Polo and catalogue local economic resources, real or supposed. From: Atlas coelestis…exhibentur a Joh. Gabriele Doppelmaiero… Nurnberg,Heredum Homannianorum,1742. 1 vol. (30 pl.) 54х36 cm. Copperplate engraving. Hand-Coloured. It is one of the first atlases of the sky, compiled on basis of the work of the German scholar Johann Doppelmeier and published by Homann. In addition to maps of the night sky with symbolic representations of constellations, the atlas includes schemes for the structure of the Solar System, schemes for the planetary motions, and a map of the Moon. This plate is a scheme for the heliocentric system of the world with images of zodiac constellations. 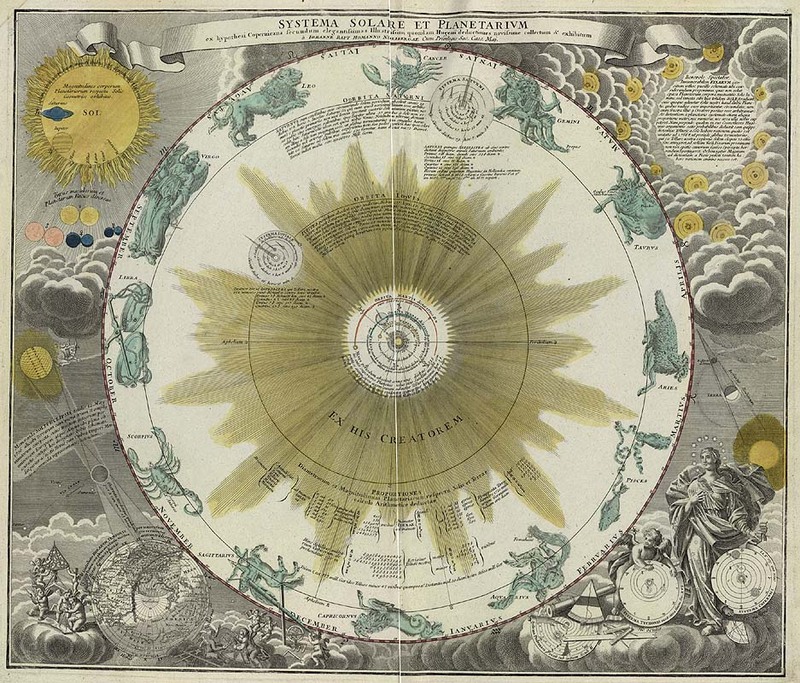 The map has a scheme for comparative sizes of the Sun and the planets, a massage to the reader, a scheme for the solar eclipse of May 12, 1776; and Ptolemaic, Tychonic and Coppernican world systems in its corners. Richly illustrated world map, created by Frederick de Wit in 1660 and published in editions of the Zee-Atlas of Hendrik Doncker from 1660 until 1670. This was De Wit’s first world map. He derived it from the two hemisphere maps from Blaeu’s wall map of 1648, reducing them in scale and making some changes. The upper corners contain northern and southern celestial maps and the lower corners show north and south polar projections. In the bottom center are astronomical diagrams: a geocentric one on the left (after Ptolomy of Alexandria) and a Copernican one on the right. The top center vignette shows the sun encircled by a zodiacal ring. Between the maps and diagrams are four vignettes with allegorical depictions of the Four Elements (air, fire, earth and water). The map also includes Baroque decorations of garlands of fruit and flowers. The Pierpont Morgan Library, NY, MS. 722, f. 18v. De sphaera mundi (Latin meaning On the Sphere of the World, sometimes rendered The Sphere of the Cosmos; the Latin title is also given as Tractatus de sphaera, or simply De sphaera) is a medieval introduction to the basic elements of astronomy written by Johannes de Sacrobosco (John of Holywood) c. 1230. 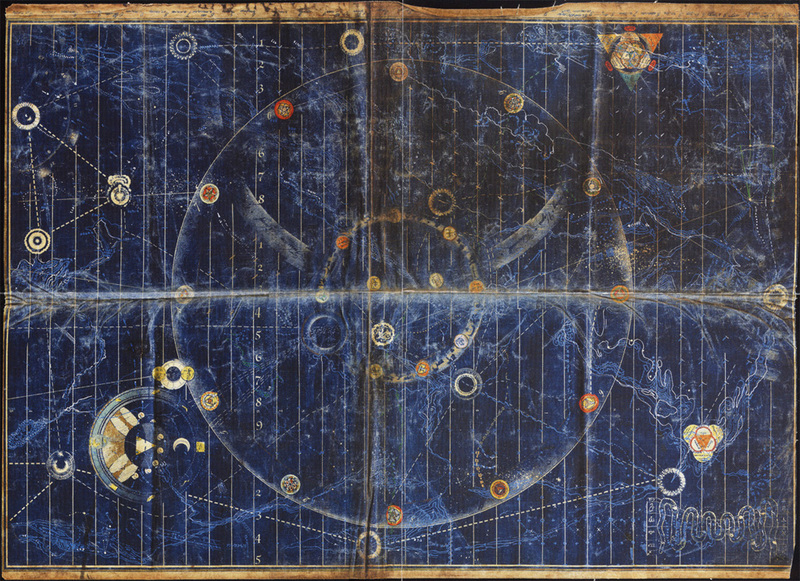 Based heavily on Ptolemy’s Almagest, and drawing additional ideas from Islamic astronomy, it was one of the most influential works of pre-Copernican astronomy in Europe. Sacrobosco’s De sphaera mundi was the most successful of several competing thirteenth-century textbooks on this topic. It was used in universities for hundreds of years and the manuscript copied many times before the invention of the printing press; hundreds of manuscript copies have survived. The first printed edition appeared in 1472 in Ferrara, and at least 84 editions were printed in the next two hundred years. The work was frequently supplemented with commentaries on the original text. The number of copies and commentaries reflects its importance as a university text. Andreas Cellarius Harmonia Macrocosmica (first published in 1660) is generally regarded as one of the most spectacular cosmographical atlases that was published in the second half of the seventeenth century. The atlas was published in 1660 and 1661 by the Amsterdam publisher Johannes Janssonius (1588-1664), as a cosmographical supplement to his Atlas Novus. Andreas Cellarius had already started working on this atlas before 1647 and intended it to be a historical introduction for a two-volume treatise on cosmography but the second part was never published. The first part of the atlas contains copper plate prints depicting the world systems of Claudius Ptolemy, Nicolaus Copernicus and Tycho Brahe. At the end are star maps of the classical and Christian constellations, the latter ones as introduced by Julius Schiller in his Coelum stellatum christianum of 1627. Constellations of the northern and southern skies, engraved by Albrecht Dürer and published in 1515 in Nuremberg, Germany. These particular charts sold at auction at Sotheby’s in March 2011 for £361,250 ($578,542). These two celestial maps are the oldest printed star charts published in Europe. Dated circa 1515, they were produced in Nuremberg under the patronage of the Holy Roman Emperor, Maximilian I, and were the product of an innovative collaboration between Dürer, the eminent Viennese mathematician, cartographer and astronomer Johannes Stabius and German astronomer Conrad Heinfogel. The woodcuts depict the northern and southern skies known to European astronomers at the time, and combine with great skill the accuracy of the stars with constellation figures as visualised by the Greeks and Romans. There are only ten other examples of the 1515 star charts extant in institutions worldwide, and the present set is one of only three recorded with contemporary hand-colouring. 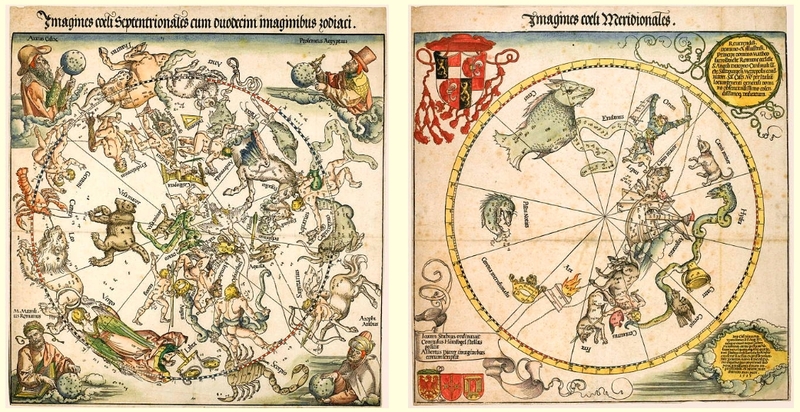 Aided by Dürer’s reputation, these star maps were highly influential and became a source of inspiration for successive mapmakers. Distilling iconography influenced by Antiquity, Greek geometrical studies and Islamic scholarship, the woodcuts display Dürer’s virtuosity and interest in science and mathematics. The maps show the stars of the forty-eight constellations based on Ptolemy’s second century star catalogue, the Almagest. 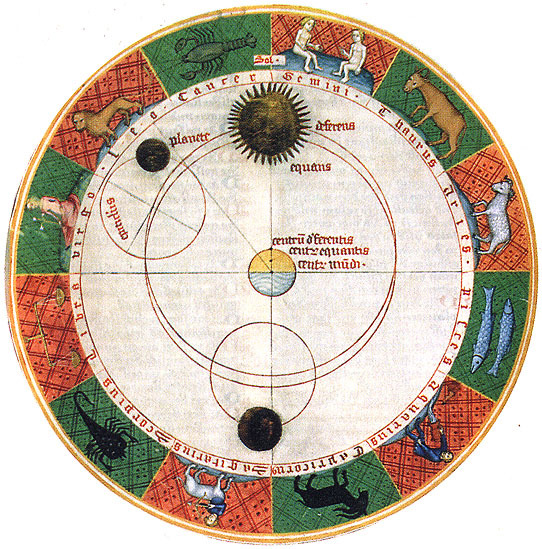 Early western maps of the skies showing both stars and constellation figures appeared circa 1440; however, the present maps were the first to chart a coordinate system with accurate placement of the stars. They attest to the role that Nuremberg played as a centre of printing as well as for the manufacture of scientific instruments. The map of the northern hemisphere is richly decorated with the twelve signs of the Zodiac, to be read counter-clockwise. Four ancient authorities appear at each corner of the northern chart, each in their national dress, holding a celestial globe: Aratus representing the Greek, Ptolemy the Egyptian, Al-Sufi the Islamic and Marcus Manilius the Roman tradition of astronomy. The map of the southern hemisphere displays distinctly fewer stars and constellations. 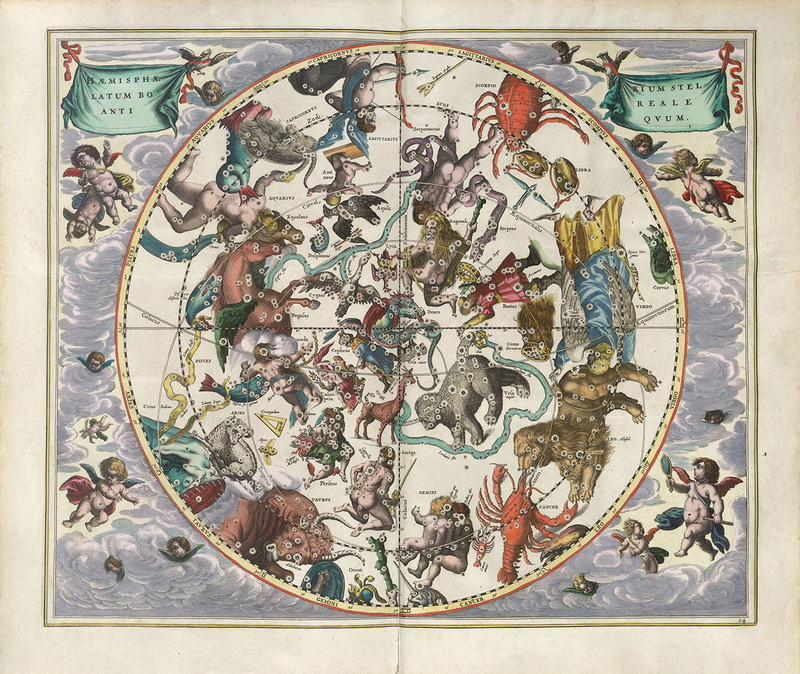 At the time, Europeans had not yet charted the southern sky; this is reflected in the pared down composition of the map, with its areas of vacant constellations.